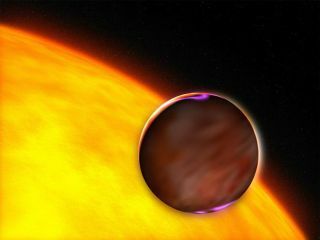 An artist's impression showing a close-up of the extrasolar planet XO-1b passing in front of a Sun-like star 600 light-years from Earth. The Jupiter-sized planet is in a tight four-day orbit around the star. A Neptune-sized world in a distant solar system orbits very close to its star and might be covered with exotic forms of water not naturally found on Earth, scientists say. The bizarre world is being called a "hot ice planet." The finding, to be detailed in an upcoming issue of the journal Astronomy and Astrophysics, marks the first time relatively small planets similar to the ice giants Uranus and Neptune in our solar system have been found orbiting very close to their stars. Prior to this discovery, only gaseous giants known as "hot Jupiters" were known to inhabit such close stellar quarters. First discovered in 2004, the planet, called GJ 436 b, is about 22 times more massive than Earth. It orbits a diminutive red dwarf star 30 light-years away from us. New observations of the planet as it "transited," or passed in front of, its parent star allowed scientists to measure its size and mass. GJ 436 b is the closest, and smallest, transiting planet to be measured in this way. "This discovery is an important step towards the detection and study of Earth-like planets," said study leader Michael Gillon of Liege University in Belgium. Sara Seager, an extrasolar planet expert at the Massachusetts Institute of Technology, agrees, calling the new measurements "a huge step in the direction of finding and characterization of a habitable planet." "It's over two times smaller than all the other planets" detected using the transit technique, she told SPACE.com. "It's a completely different kind of planet." The measurements, made using a telescope at the Observatoire Francois-Xavier Bagnoud (OFXB) in Saint-Luc, Switzerland, revealed GJ 436 b has a diameter of about 30,000 miles (50,000 kilometers)-four times that of Earth. Based on its size and mass, scientists think the planet is composed mostly of water. If the planet were a gas giant like Jupiter or Saturn and contained mostly hydrogen and helium, it would be much larger, and if it was made up of rock and iron like Earth and Mars, it would be much smaller, the scientists say. The water world could be enveloped by a thin atmosphere of hydrogen and helium, like Neptune and Uranus, or could be surrounded entirely by water, like Saturn's moon Enceladus. GJ 436 b orbits its star from a distance of only about 2.5 million miles (4 million km)-about 14 times closer than Mercury's average distance from the Sun. At such close quarters, scientists think its surface temperature is at least 600 degrees Fahrenheit (300 C) and any water on its atmosphere would be in the form of steam. Water on the surface of the planet is a different matter, scientists say. The pressures on GJ 436 b are so great that water would adopt forms not found anywhere on Earth except in laboratories. "Water has more than a dozen solid states, only one of which is our familiar ice," said study team member Frederic Pont of the University of Geneva in Switzerland. In the same way that carbon can transform into diamonds under extreme pressures, water turns into other solid states denser than both liquid and ice under very high pressures. Physicists call these alternative forms of water Ice VII and Ice X. "If Earth's oceans were much deeper, there would be such exotic forms of solid water at the bottom," Pont said. Seager said the existence of different forms of ice on GJ 436 b is certainly viable, but notes there are other explanations for the results. "For example, you could have a planet that's mostly rock like our own Earth, but just a huge version of it," she said in a telephone interview. A planet with 20 Earth masses of rock and 2 Earth masses of hydrogen and helium in its atmosphere would also match the mass and size profile measured for GJ 436 b, Seager said.